The sun shone down on St. Mary’s Menston as we gathered as a community to celebrate 50 years of Catholic Education on the Feast of the First Martyrs of the Holy Roman Church. Bishop Marcus and 10 of his clergy, who serve and have served the school so faithfully over the years, celebrated Mass for a congregation comprising of 560 students from across Years 8 to 10, current staff, former staff, Headteachers from across the Diocese, Governors, Diocesan representatives, Councillors and friends of the school. Year 7 students formed a very proud Guard of Honour which lined the processional route from the Chapel to the Sports Hall where Mass was held. Year 7 then participated in the Mass through a live link. Four lit lanterns were placed in front of the altar to represent Year 7, present staff and students, former staff and students and staff and students who now live in peace with Christ. Mass then began with the blessing of the new Presidential Chair. In the Post Communion Reflection Mrs Gerry Sayers reflected upon her 24 years of service here at St. Mary’s and the vision of Mr Dalton, first Headteacher at St. Mary’s, Menston, for this excellent establishment. She concluded by congratulating the school on attaining an Outstanding Ofsted grade. In his address, Mr Beardsley realised the responsibility of all current staff to maintain and further those excellent standards. 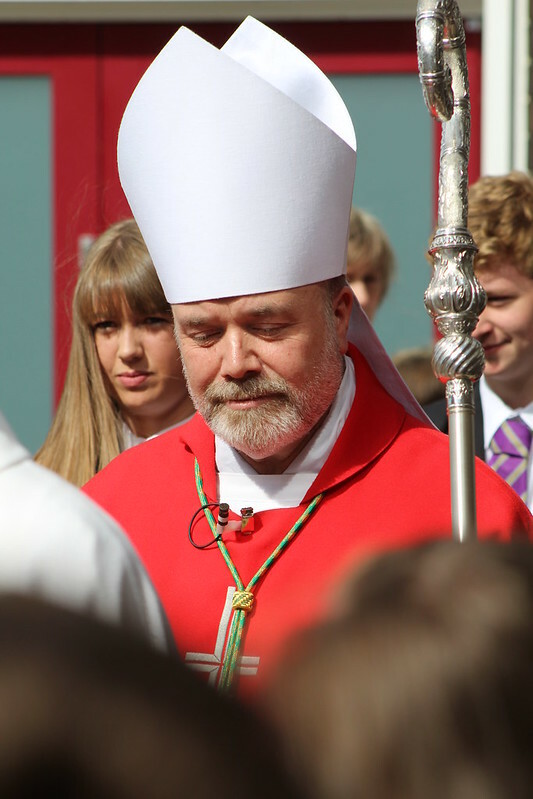 At the close of the Mass, Bishop Marcus gave us a new standard: he said we are exceptional. The morning was truly exceptional and our thanks are extended to all those who so readily contributed and gave of their time. “The Mass was a true celebration of what we are about as a school, with Christ at the centre of all that we do. The reverence shown by our students throughout the Mass was impeccable and we were delighted to welcome so many friends of the school. It was a real team effort throughout: for example, staff baked 941 cupcakes and decorated them in school colours. These were enjoyed during an extended break by all students, staff and visitors.